Tao Magazine is a monthly lifestyle magazine in Hong Kong. It provides information and graphics on the latest trends on fashion, entertainment and lifestyle. How may the foldable travel bag be used as a gift with purchase? The foldable travel bag is light and convenient. It comes with a comfortable handle which makes the travel bag great for carrying heavy weight over long distances. It can be easily folded into a slim, portable and flat piece which makes it easy to be stored and carried around. The foldable travel bag is spacious and may be used to store and carry large amount of items or bulky objects in it. Tao Magazine may brand its logo on the travel bag in order to increase brand awareness. Thus, more people will know about Tao Magazine and they may be inclined to buy it. This will increase the reader base for Tao Magazine as well as increase its sales. Furthermore, the logo will also boost brand recall. This will reinforce brand loyalty as readers will be reminded to buy or subscribe to Tao Magazine. Hence this will increase sales for Tao Magazine. 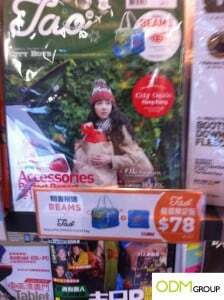 Moreover, readers will be enticed by the travel bag and they are more likely to buy the magazine. What do you think of this gift with purchase?